Please look into the fact that recently, in order to stifle dissident voices, the Hong Kong Communist Government has been arbitrarily arresting and prosecuting people by way of outdated clauses in Hong Kong Public Order Ordinance. And the sentences of defendants in riot cases are in general incredibly harsh, such that a lot of good people are now in prison. These phenomena are suspected of contravention of International human rights. Evil clauses in the Public Order Ordinance, like unauthorized assembly and unlawful assembly, should be abolished as they contravene the rights to freedom of speech, assembly and demonstration, as enshrined in the International Covenant on Civil and Political Rights. The riot charge is also outdated, its definition vague, and its maximum penalty too heavy, contradicting the notion of proportionality which is part and parcel of human rights law. It should therefore be abolished or at least its definition should be narrowed down and clarified. The way certain riot cases were tried recently are suspected of contravening the presumption of innocence. The defendants might not have been proven guilty beyond a reasonable doubt. Did the judges concerned not intend to dissuade future protesters with exceedingly heavy penalty? Was the protester-defendants' contribution to the democracy and freedom of Hong Kong society taken into account in sentencing? Efforts had better be made to rescue righteous people wrongly imprisoned. HK Public Order Ordinance originated from the 1967 Riot, in which local communists killed and injured numerous innocent citizens. The HK Government then passed the Ordinance to deal with local communists. Certain evil clauses in the Ordinance were abolished in 1995, which were, however, revived by the Provisional Legco in 1997. E.g., in 1995, public assemblies only required prior notice of the Police while they now require a "notification of no objection" from the Police. The offenses of unauthorized assembly and unlawful assembly apparently contravene the right of peaceful assembly as enshrined in International Covenant of Civil and Political Rights. When three persons or more gather in a public place and cause fear of "breach of peace" , they may be found guilty of unlawful assembly, but "breach of peace" is excessively vague, and thus easily abused by the authorities. The concept of proportionality is indispensable to human right law. It means that legal measures restricting civilians' rights must be proportional to the end of public interests and social security. It also means punishment being proportional to crime. Once the link between a unlawful assembly and "breach of peace" is confirmed, the participants will be found guilty of "riot", the maximum penalty for which is 10 years in prison! This is excessive and, in recent cases, out of proportion with the alleged acts. Compared with the 1967 Riot, the 2011 London Riot, etc. the 2016 Lunar New Year Mongkok "Riot" is just a minor matter, or a police-civilian conflict. The 2016 Mongkok police-civilian conflict originated from righteous civilians supporting hawkers in defiance of brutal police officers, and the protesters are meritorious ethically and politically. Likewise, The Sunflower Student Movement is associated with protest against the secretive Cross-Strait Service Trade Agreement. In contrast with HK courts, the Taiwan law court finally acquitted the protesters on the ground that the movement was civil obedience. The way several Mongkok riot cases were tried recently are suspected of contravening the principle of presumption of innocence as enshrined in the Universal Declaration of Innocence. E.g., in the Yeung Ka-lun case, the judge Anthony Kwok on 3 April, 2017, found the defendant to be the culprit on the ground that both the defendant and a photo of the culprit had protruding teeth. In another riot case, the Judge Sham on 16 March, 2017, rejected a defendant Sit’s defence that he had only been mere observers at the riot. He said that Sit should not have run away along with the crowd – which could have caused a stampede – if he did not want police to confuse him with a rioter. Yet, by common sense, everybody knows ten persons being chased by a dog have ten different reactions. "No one shall be subjected to arbitrary arrest, detention" (International Covenant on Civil & Political Rights, Art. 9). 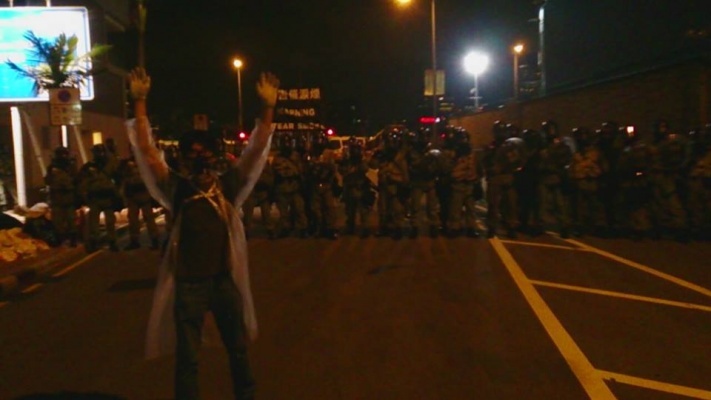 Yet, after the Umbrella Revolution, the HK police has kept arbitrarily arresting and charging dissidents. Example 1: Democratically elected law-makers Baggio Leung and Yau Wai-ching have been charged with unlawful assembly in the Legco, for having tried to force their way into a Legco conference against a number of security guards sent by the Chair of Legco to stop them. At that time, they were not yet disqualified for challenging China during a swearing-in session. Example 2: Occupy leaders each face public nuisance charges under the Common Law over 2014 Hong Kong protests. The maximum penalty is 7 years in prison, while under the Summary Offences Ordinance, the maximum penalty for nuisances committed in public place (which refer to minor offences like urinating in a public place) is only a fine of HKD500 or three-month imprisonment. Example 3: Nine Hong Kong activists , including two from Demosisto as well as members of League of Social Democrats and Student Fight for Democracy, were charged with incitement to behave in a disorderly manner in a public place, taking part in an unlawful assembly, etc. in a protest against Basic Law interpretation by Beijing. The Human Rights Committee had better look into how Hong Kong police and judiciary have been trampling upon human rights and universal values in HK. Public assemblies, protests and demonstrations should only require perfunctorily notifying the police. Either the riot offence should be abolished or its definition narrowed down. The HK courts should strictly comply with the principles of presumption of innocence and reasonable doubt, and sentences must be proportional to corresponding crimes. The HK police must stop arbitrarily arresting dissidents and the HK Government must not try to suppress voices of protesters by judicial harassment. As for innocent people already imprisoned, they should be released as soon as possible by such means as appeal or through international support.